The last fireworks have exploded in the Caribbean Premier League. The smoke has cleared but things on the ground may never be the same again. That would be a good thing. When Albie Morkel delivered the first ball back on July 30 at Kensington Oval, no one was quite sure how things would turn out for this franchise-based professional venture, a first for West Indies cricket. Three and a half weeks later, there is no doubt about how the CPL has done. In bars, offices, and, most tellingly, at the stadiums, the CPL has been the flavour of the month, a cricketing phenomenon from which a number of things have been learned. Regional competition may be sorely lacking crowds and sponsors. But this inaugural edition of the CPL showed that with the right packaging, people will come, and keep coming - to T20 cricket, at the least. If nothing else, the first edition of the CPL was a people festival. From that opening match in Barbados right through to the grand final at Queen's Park Oval in Trinidad, where the local franchise was not represented, the crowds were huge. Ticket touts did thriving business. Even at the venues of the less successful teams, in Antigua and St Lucia, there were never-before-seen audiences. Ample marketing of the CPL as a Caribbean party and affordable tickets kept the stands packed. And as the matches moved from island to island, the enthusiasm was contagious. "We were very clear from the start that we wanted the CPL to be accessible to everybody," says the CEO, Damian O'Donohoe. "When you stand at the gate and watch people come in, it's whole families, grannies, granddads, mothers, fathers, kids. And that's what the CPL is all about." Corporate Caribbean was sold on the concept also. "Nothing short of phenomenal," is how O'Donohoe describes the response of regional companies to the tournament. "Eighty per cent of the income we've received has been local sponsorship." Those figures should give West Indies Cricket Board CEO Michael Muirhead much food for thought. Brought up on island rivalries, the concept of supporting non-national teams took some getting used to for sections of the regional population. But as the series progressed, the nationality of players became almost moot. "You have Trinidadians playing in Barbados, and Jamaicans playing here, there and everywhere, so it's not about Trinidad versus Barbados anymore. And the competition has been very good," says West Indies coach Ottis Gibson. "I think the response to [Kieron] Pollard in Barbados, to the first three games in Barbados especially, has been very, very good. I know he was a little bit wary of what sort of reception he would get, and I was pleased that he got such a good reception." And despite lingering disaffection in some quarters, territories in general gained new appreciation for the region's representatives. Jamaican left-armer Krishmar Santokie must have special status now in Guyana after his Player-of-the-Series performances for Amazon Warriors. This was regional integration by force. And there was no less an intensity to the cricket. In fact, the passion among players seemed to be even greater, every game having its element of a big occasion. The West Indies selectors would happily have taken note that while the big stars - Sunil Narine, Dwayne Bravo, Pollard and Chris Gayle - had their moments, others normally operating in their shadows grabbed their chances in the spotlight. Santokie, with his late swing, accuracy and clever variations, did not so much step from the shadows as remind everyone of how incisive a bowler he can be in the shortest version. He has played just two T20s for West Indies. His countryman and fellow left-armer, the pacier Sheldon Cotterrell, from Antigua Hawksbills, also demanded that the selectors consider him in the near future. While Cotterrell is yet to play international cricket, St Lucia Zouks opener Andre Fletcher has been tried and found wanting in the past. But in CPL 2013, he added some needed consistency to his clean hitting and competent wicketkeeping to amass 238 runs at an average of 39.66. Fletcher was a constant danger at the top. And his was the best effort from a batsman who side did not get to the knockout stage. Meanwhile, Trinidad and Tobago Red Steel's teenaged left-hander Nicolas Pooran's audacious debut 54 against Amazon Warriors was a sign of a talent that must be nurtured carefully. Andre Russell does not fit the bill of unknown rookie. But having lost his way and his West Indies spot in T20s and ODIs this year, he used the CPL to make a statement. His bat spoke powerful words as the tournament got to the crunch matches. 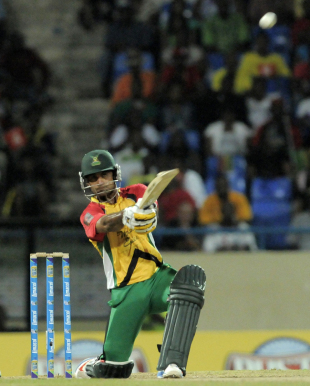 And his explosive hitting gave Jamaica Tallawahs real momentum in the middle order. He was a combination of consistency at high voltage, averaging 50 with a strike rate of 189. Russell's bowling still is not where it should be, but this tournament must have done his confidence much good. Not all the overseas pros who came through the draft were hits. But Tallawahs would not be champions today had they not had Vernon Philander and the evergreen Muttiah Muraliatharan. Both were positive influences on and off the field. And Philander did his case for limited-overs selection for South Africa no harm, displaying guile to go with his trademark control. Mohammad Hafeez, for Amazon Warriors, played one of the knocks of the tournament, a nerveless, breezy 50 in Antigua to deny Hawksbills a place in the semi-finals. His New Zealander team-mates Martin Guptill and James Franklin were even bigger influences on Warriors' progress to the final, while Pakistani Shoaib Malik carried Barbados Tridents' batting for a tournament-high 272 runs. And while they were late in coming, Sri Lankans Tillakaratne Dilshan and Kumar Sangakkara brought their class to bear with Player-of-the-Match performances for Amazon Warriors and Tallawahs in the two semi-finals. Once the word spreads, the CPL should attract more star quality in future. In this first year, however, it was the general competitiveness and atmosphere at the matches, not a multitude of batting highlights that defined the tournament. Totals were generally on the low side. Blame the sluggish pitches. Pitch quality must improve if the CPL as a cricket product is to grow Teams had to work too hard for their runs, especially in the semi-finals in Trinidad. It was not the ideal recipe for a T20 extravaganza. But not even this long-standing problem for West Indian administrators could spoil the Caribbean party the CPL undoubtedly was. In their post mortems, the organisers may want to look again at the round-robin format, where all teams did not meet, home and away. They may also want to reconsider predetermining the venues for the knockout matches and potentially denying the more deserving sides the chance to play before their fans. Not much tweaking is necessary however. "We are now where we expected to be in year three," says O'Donohoe. The CPL has hit on a winning formula. It must stick to its solidly planted roots.